Thanksgiving is one of my favorite holidays. I remember my first Thanksgiving after coming here to America from Italy. I was so young then but the sights and sounds of an American Thanksgiving instantly transformed me. In our small apartment in Queens, my mother and I prepared a turkey with all the fixings. That time of year the house was filled with family too, and of course, new friends from the new world. Now I celebrate with my own children, and their families. 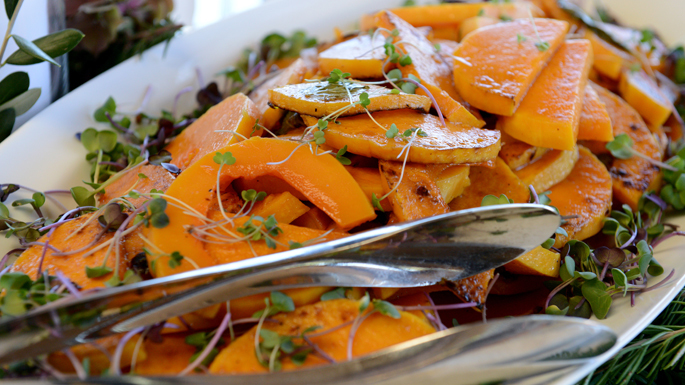 Here is one of my favorite recipes for Thanksgiving, Marinated Winter Squash. Though I recommend butternut squash for this, acorn, Hubbard, and other varieties will work as well. Mix the vinegar, sugar, and ¼ teaspoon salt together in a small saucepan. Let simmer over high heat until the sauce is reduced by half. 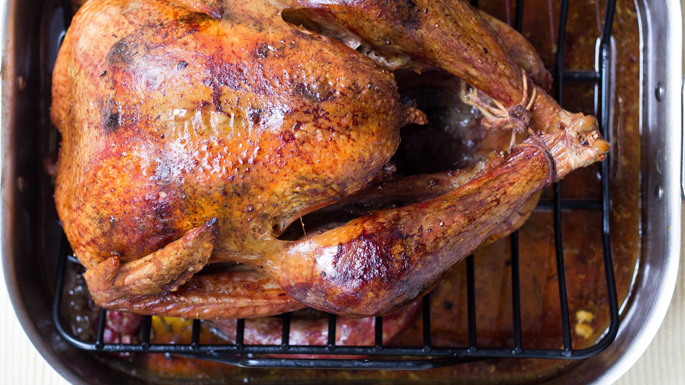 Remove from the heat, drop in the garlic slices, and let the marinade cool. Stir in the olive oil. Slice the squash in half lengthwise, and scrape out all the seeds. Peel the halves; with cut side down, cut crosswise into 1/2 inch-thick half-rounds. Pour a thin layer of vegetable oil into a deep skillet, and set over medium- high heat. When the oil sizzles on contact with the squash, fill the pan with a layer of slices, spaced slightly apart. Fry for about 3 minutes on the first side, then flip the slices over. Fry on the second side another 2 or 3 minutes, until the slices are cooked through (easy to pierce with the tines of a fork), crisped on the surface, and caramelized on the edges. Lift out the slices with a slotted spoon, draining off oil, and lay them on paper towels. Sprinkle some of the remaining salt lightly on the hot slices. Fry up all the squash, in batches, the same way. Arrange a single layer of fried squash in the bottom of the marinating dish, and scatter four some of the shredded basil leaves on top. Stir up the marinade, and drizzle a couple of spoonfuls over squash. Continue to layer the squash in the dish, topping each layer of fried slices with basil leaves, and garlic marinade. All the seasonings should be used— drizzle any remaining marinade over the top layer of squash. Wrap the dish in plastic, and marinate the squash for at least 3 hours, preferably overnight in the refrigerator; let it return to room temperature before serving.